Welcome to the Blatnick park grassland bird initiative. The Town of Niskayuna, with the cooperation of the Audubon Society of the Capital Region, is trying to re-establish New York native grassland birds to this area. Why is protecting these birds important? Several grassland bird populations are rapidly declining in New York State. Data from the Breeding Bird Survey (BBS) indicates that populations of Henslow’s Sparrows have decreased by over 99% in New York and Grasshopper Sparrow populations have decreased by 97%. The Bobolink has experienced population declines of 50%. Experts studying this problem believe that habitat loss, fragmentation, and deterioration are the main reasons for this decline. What is a Bobolink? The average adult Bobolink is 6 to 8 inches long and weighs about one ounce. 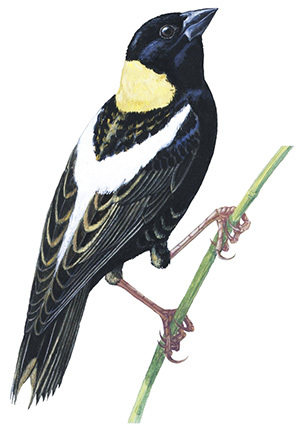 The Bobolink is a ground forager, feeding on seeds, grains, insects and spiders. They also nest on the ground, using dead grass for the outer wall and fine grass for the lining. More ambitious birds may build a canopy over the nest for shade and to hide from predators. The Bobolink spends the winter months in Argentina, Bolivia and Paraguay flying over 5, 000 miles to reach their wintering grounds and then flying another 5,000 back to nest here in Niskayuna. That is an amazing 10,000 miles round trip. The collective name for a group of Bobolinks is a chain. How can you help? Bobolinks have been seen in this area and we are strongly encouraging them to nest to help re-establish the population. The Bobolinks preferred habitat is un-mowed, tall grassland. The Town of Niskayuna has agreed to an alternative mowing schedule to keep the grass long. Bird watching is encouraged but please do so quietly and from a distance. Please do not walk in the protected area. Bobolinks nest on the ground from May to August and you may step on fragile eggs or young birds. Please keep your dog leashed in this area to avoid disturbing nests.